A large sheet bronze idol-figure with a plain round body rising to a rectangular pierced trunk with repousse decoration. The top terminates in two stylised heads each decorated with a cross and dots. The exact meaning or purpose of these enigmatic objects remains unknown. It has been suggested that the body was used as a mirror though the handles were rarely designed for practical use. 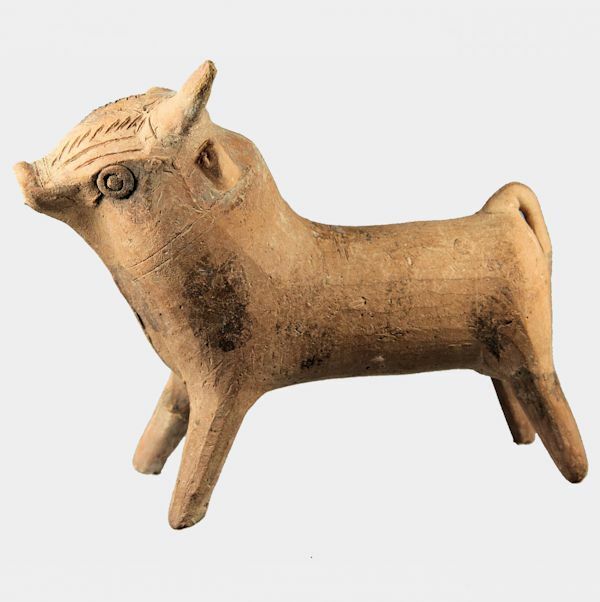 Excavations have revealed that these objects were placed in burials and may therefore have had a ritual significance. The abstract shape suggests a connection with earlier idol figures. Ex. private collection, London, UK; acquired 1970’s-1980’s.